Phaedra performs works for string quartet exploring the human voice, pairing works by two iconic New York singer-composers with two London-based composers commissioned by the ensemble. Caroline Shaw is a singer, violinist and composer the ensemble feels a strong connection with, having performed with her at the Barbican in 2015. She was awarded the Pulitzer Prize for her Partita for 8 voices in 2013 and is the founder of the Grammy Award winning vocal ensemble, A Room Full Of Teeth. She has written for Bang on a Can, Renée Fleming and Dawn Upshaw, and produced tracks for rap artists Kanye West and Nas. Similarly, Meredith Monk's focus on the voice coincides with Phaedra's ongoing fascination with music that centres around the innovative and extraordinary use of the voice, explored in their ongoing VOX series. String Songs is Monk's first string quartet, transplanting her iconic vocal style and sound world onto stringed instruments. Fred Thomas studied piano and composition at the Royal Academy of Music and is one of London’s most sought after multi-instrumentalists and composer/arranger/producers. A member of the F-IRE Collective, he recently embarked on a quartet of J.S. Bach recordings to be released on ECM, The Silent Howl and Odradek Records. While I nap I pound the rice was commissioned by Phaedra in 2017 for string quartet, prepared piano, percussion and narrator with funding from Arts Council England. Jamie Hamilton is a composer and mixed-media artist and is co-director of Phaedra, writing extensively for the ensemble. He works collaboratively, often devising works through conversations with other artists, combining contextual sounds, multimedia and acoustics to explore ways in which sound acts as a measuring device, heightening aspects of our perception. Remainder was written for the ensemble and is a exploration of the many techniques that were developed with him incorporating speech, singing and vocalisations with instrumental playing. Founded in 2014, Phaedra is a new music group built around a string quartet plus collaborators from across London’s diverse musical landscape. Incorporating jazz, folk, contemporary classical and experimental music, Phaedra regularly commissions new works for the ensemble and often collaborates with artists from different genres and disciplines. Previous performances include Kings Place, Cafe Oto, the Barbican, the Roundhouse, Purcell Room, Queen Elizabeth Hall, NYU Arts Center, Abu Dhabi and La Seine Musicale, Paris, with broadcasts on BBC Radio 3 and Resonance FM. 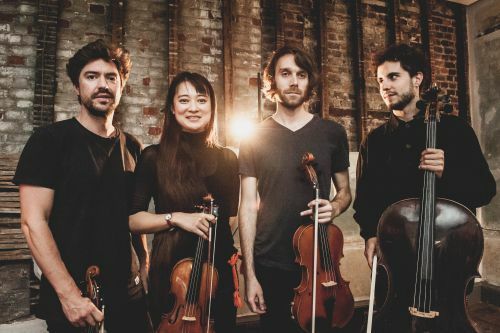 2019 will see the continuation of their VOX series plus two releases featuring the works of Meredith Monk, Fred Thomas and Frederic Rzewski, and the debut album of composer Jamie Hamilton.